30th June, Hong Kong: 2017 World Championships Trios gold medallist, Wu Siu Hong won his sixth Hong Kong International Open title after emerging as the Men's Open Masters champion while topseed, Yanee Saebe of Thailand claimed her first crown. 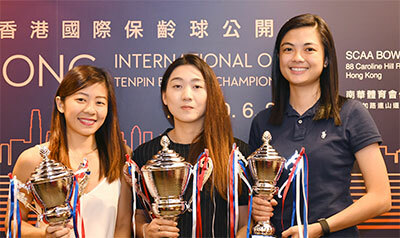 2017 World Championships Trios gold medallist, Wu Siu Hong won his sixth Hong Kong International Open title after emerging as the Men's Open Masters champion while topseed, Yanee Saebe of Thailand claimed her first crown. The 34-year-old Hong Kong national bowler had to work doubly hard for the victory. Wu tied third position with Singapore's Jonovan Neo after the 8-game Stage 2 finals on 1821 and had to go through a one-game roll off to break the tie and to determine their seedings for the stepladder finals. Neo defeated Wu, 242-225 to take third-seed while Wu settled for fourth-seed and needing to bowl against fifth-seed, Merwin Tan of Philippines and sixth-seed, Tony Wong of Hong Kong in the first match. Wu, however breezed past Tan and Wong, 277-224-231 to advance to the second match. Wu was equally impressive in the second match against second-seed, Hassan Alshaikh of Saudi Arabia and a re-match with Neo. Wu took the second match, 226-209-187 and earned a crack at the title against topseed, Darren Ong of Singapore. The challenger forced the tie into a second decider after he trashed the Singaporean, 229-146 in which Ong suffered two splits and three opened frames. In the title deciding match, Wu showed no mercy as he romped home with another easy 227-155 victory after a 11-year gap. The champion, who last won the title back in 2006, picked up the top prize of HK$60,000 (approx. US$7,600). 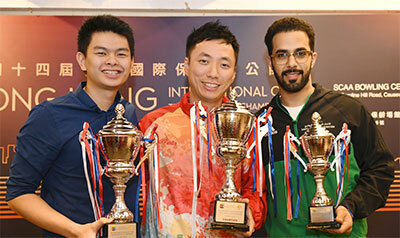 Ong took home HK$25,000 as first runner-up and Alshaikh HK$16,000 as second runner-up. Neo settled for HK$8,000, Wong earned HK$5,500 and Tan HK$4,500. In the earlier Stage 2 finals, Ong topped the field with 1834 followed by Alshaikh in second with 1822. Neo and Wu tied third spot with 1821 while Tan and Wong made the top 6 stepladder finals in fifth and sixth positions with 1812 and 1774. Indonesia's Billy Muhammad Islam missed the cut for the stepladder finals by 12 pins finishing in seventh position with 1762. Kuwait's Mostafa Almousawi, Hong Kong's Wicky Yeung and Thailand's Annop Arromsaranon completed the top 10. In the women's division, topseed Yanee Saebe of Thailand needed only one match to beat her challenger and to claim her first Hong Kong Open crown. The 25-year-old outclassed second-seed, Bernice Lim of Singapore, 212-165 for a well-deserved victory. Lim, who defeated third-seed, Joey Yeo and winner of the first match, Daphne Tan, 235-201-223 in the all-Singapore second match. Tan edged fifth-seed, Hee Kar Yen of Malaysia and sixth-seed, Shayna Ng, 186-164-182 in the opening match. The Thai pocketed the women's top prize of HK$30,000 (approx. US$3,88) as champion. Lim took home HK$16,000 as first runner-up while Tan earned HK$8,000. Yeo, Ng, Yeo and Hee settled for HK$4,000, HK$2,700 and HK$2,000 for finishing fourth to sixth positions. The champion literally led from start to finish to win the earlier Stage 2 finals with 1834. Lim trailed in second by 100 pins with 1734 and Yeo third with 1705. Tan finished fourth with 1687 followed by Hee in fifth with 1678. Ng squeezed into the stepladder finals in sixth position with 1661. Last week's ABF Tour Macau leg champion, Nora Lyana Natasia of Malaysia and Cherie Tan of Singapore tied in seventh position and both missed the cut by 38 pins. The top 16 men and top 16 women based on their final standings after the stepladder finals and Stage 2 finals, qualified for the third 2018 ABF Tour - Hong Kong tomorrow at the same bowling centre. Photos by Terence Yaw in Macau, China.